Meidän studiot ja huoneistot sijaitsevat Manhattanin keskustassa lähell�� Empire State Buildingia, Times Squarea (15 minuutin kävelymatka), ja lähes kaikki tärkeimmät matkailukohteet saavutetaan suurten julkisten liikennevälineiden, kuten metrojen ja linja-autojen, sekä autopalvelun ja NYC-taksin kautta. Yhdistyneet Kansakunnat (10 minuutin ohjaamo): Erillinen monimutkainen yhdysvaltalainen NYC, joka on toiminut Yhdistyneiden Kansakuntien virallisena p��ämajana. Central Park (3 pysäkkiä metrolla): Manhattanin sydän on olennainen hengitystila. Laze ympärillä; Nauti veneilystä järvellä tai julkisia esityksiä ulkoteatterissa. The location was perfect for our short trip. The building is a little rundown like other reviews have stated. The studio itself however was well maintained. The host provides the bare minimum. Be prepared to have your own toiletries. Also, the email communication leading up to our visit was non-existent. I sent a few emails before our check-in and never received a response. However, we unexpectedly had to check-out early and was able to leave our key with the doorman. Min responded letting me know she had received the key and everything was good with out check-out. For the price we paid we couldn't beat this location. Bare bones, small studio, great location. The overall apartment itself was a good apartment, clean and in a great location, it was close to everything! The apartment fit me and my 3 siblings perfectly with the three beds! However the noise was unbearable, there was not an hour that went by where there wasn't someone stomping or running across the hallway outside or upstairs. It sounded like there may have been construction going on upstairs as well? The walls are very thin so you often can hear conversations going on outside the doors too. If a good night sleep is important to you, I would not recommend this apartment. This apartment is very centrally located. It is near great shopping, the subway station, the Empire State Building and my daughter's school(FIT). The various doormen, and other building employees were all pleasant. Unfortunately, there are various negative aspects to this apartment. It is not quite as depicted on the website. It was not as clean as I had hoped. I shouldn't need to wipe down the apartment, clean the air conditioner filter, buy new pillows and wash the dishes, before I feel that it is clean. There should be glasses in the kitchen cabinet and I shouldn't need to repair the bar stools. There should not be mold around the tub and there should be a soap dish in the tub. All light sockets should have a light bulb in them. I don't feel that I should have worn and tattered towels when I have paid a lot of money for a 3 week stay. In addition, why is there such a terrible smell in the hallway, every single day?! The windows are almost useless because it is always dark in the apartment due to the location of the apartment in the building. Finally, it is disconcerting when not once, but twice, someone tries the doorknob to get into the apartment. I cannot, in good conscience, recommend this apartment. It was a nice small apartment, well located with welcoming hosts but the communal areas were dirty and substandard. The apartment was in a building whose interiors looked like a run down youth hostel ( old paint coming off, smells, dirty corridors... ). It's a shame that the freeholders dont seem to care about it. Unfortunately, we don't see those parts on the website. Four of us stayed for 4 nights end of August, it was a great location, walking distance to everything and subways. Very spacious, clean fully stocked. Will definitely consider booking again. 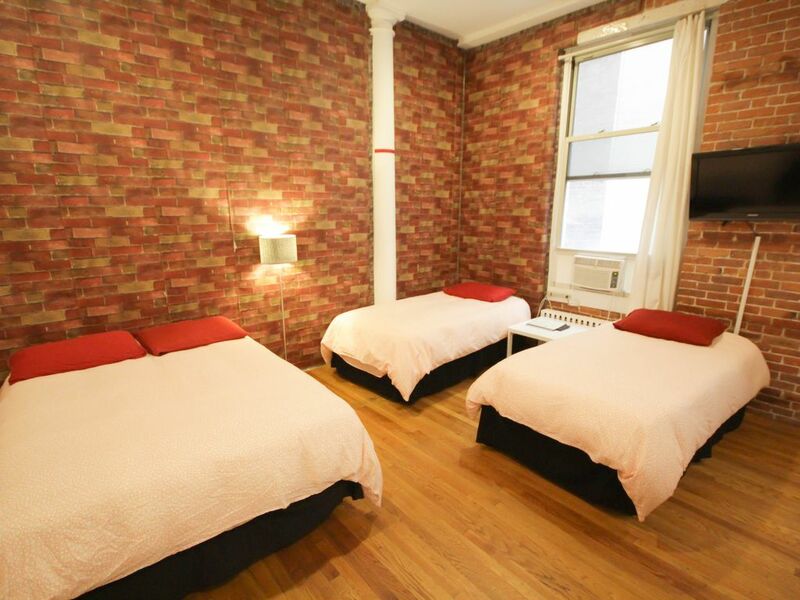 I feel so fortunate, to have chosen this studio apartment, to rent, for my five night stay in NYC. I feel so fortunate, to have chosen this studio apartment, to rent, for my five night stay in NYC. The apartment was exactly as it was described, and displayed in the photographs. The location was perfect and convenient to anything we could want (subway, times square, empire state building, shopping, cafes, etc), and we (me and my two teens) felt totally safe. I did not have to contact James, at all, during our stay. And the few times I needed to contact him, before our arrival, he was ,100% responsive and helpful. I will definitely, choose this apartment, for my future visits.